Are you a fitness freak and want to improve your strength and build your muscles while staying at home? If you are, then buying dumbbells is a wise decision. Dumbbells are considered as the essential tools that can be used in a variety of exercises to increase the intensity of the workout. 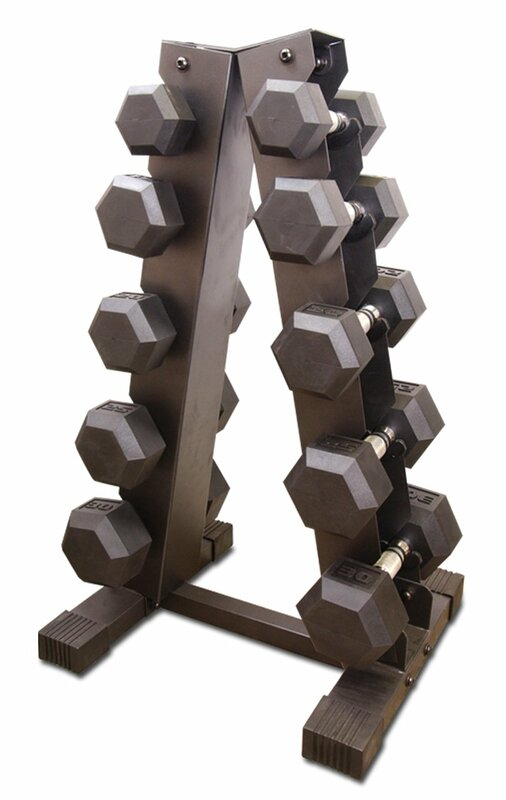 If you are thinking of buying dumbbells, you may want to consider getting a nice dumbbell set with a rack alongside it. Having huge weights scattered over your floor will look chaotic and can even be dangerous for your family members. A rack will spare you from any inconvenience and help you to manage the workout space efficiently. Dumbbells come in two types i.e. with adjustable weight and with fixed weight. The adjustable dumbbell setsare those dumbbells whose weight you can change by adding weight plates according to your workout need. Whereas, fixed weight dumbbells come with fixed weights that cannot be modified. Cap Barbell PVC Coated Dumbbell Set, 200-Pounds: It is a robust and a budget friendly weight set that will last for a long time! Cap Barbell Rubber Hex Dumbbell Set, 150-Pound: It is extremely affordable and offers a great set of dumbbells with a rack that is super easy to assemble. 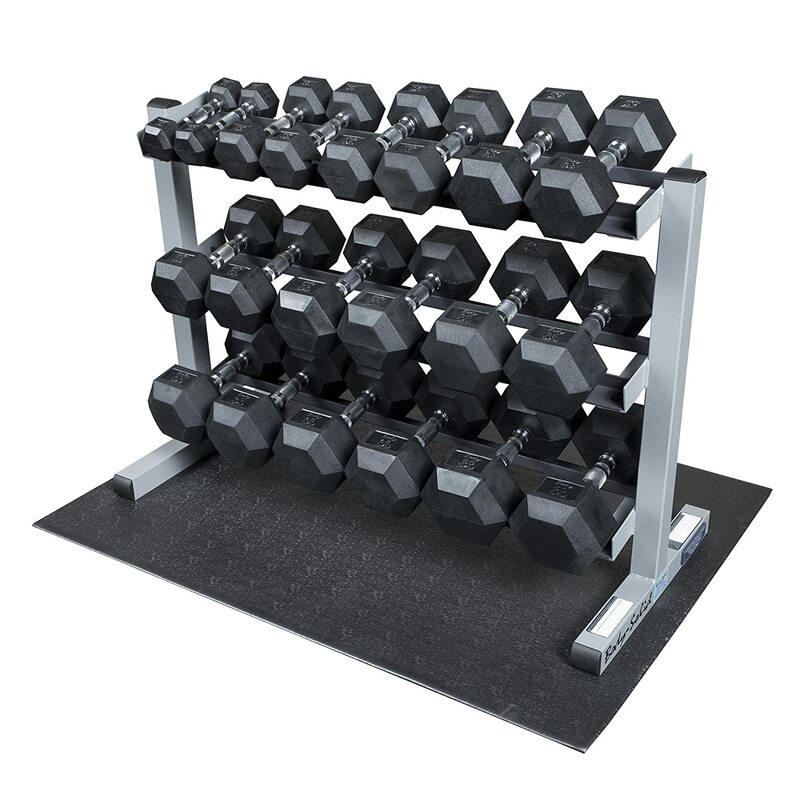 Body Solid GDR363-RFWS Dumbbell Rack with Rubber Dumbbells: It is expensive but it includes everything you need to train with free weights, including dumbbell rack, set of dumbbells, and a rubber mat to place it all on. Hampton Fitness Dura-Bell 8 Pair Dumbbell Set with V2-8 Rack: Good looking, compact and space saving the design, Ideal for studios or home use. XMark’s 550 lb. Premium Hex Dumbbell Set (10 Pair: 5 lb. to 50 lb. 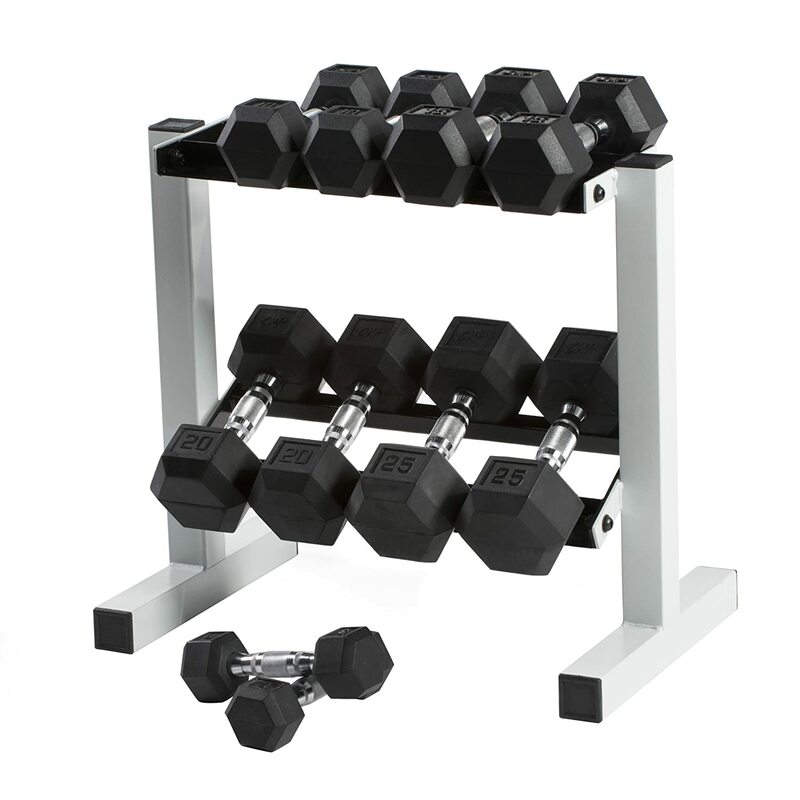 Pairs) with XMark’s Heavy Duty Three Tier Dumbbell Rack (Gray or White Rack): A versatile home gym staple that is perfect for beginners or seasoned athletes. The dumbbell set racks can be found in both horizontal as well as vertical stands and come in various attractive designs. 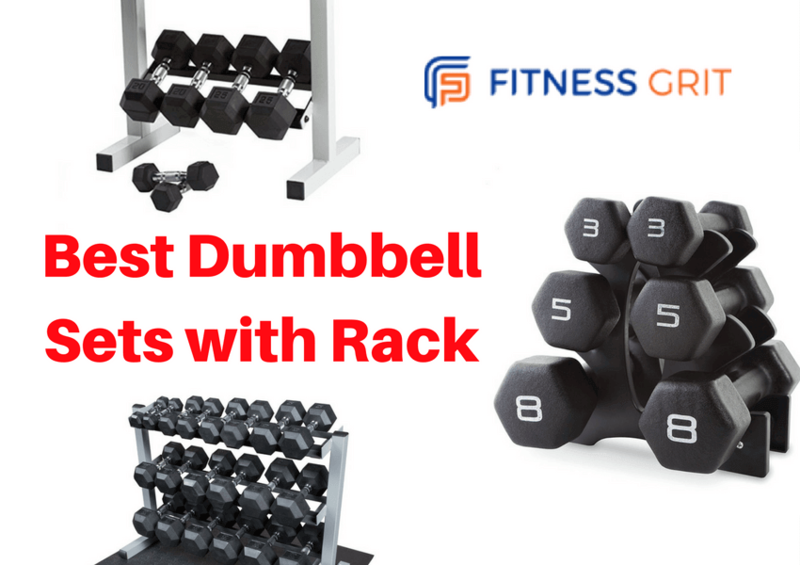 If you are unable to decide which dumbbell set with a rack to buy, then you don’t need to fret anymore because we have comprehensively reviewed top five dumbbells sets with racks to help you equip your home gym according to the latest trends. Cap Barbell PVC coated dumbbell is considered as a strength training exercise equipment that is mostly used as a product for home use and gaming with ease at home. The product is designed keeping in view the principle of comfort and durability for the customers. As the name indicates, there is no rubber odor typically associated with rubber coated dumbbells. The good thing about the product is that it comes with a set of supporting features that aid the person to avoid any injury. The product ensures the comfort of the gamer, therefore, the package includes a pair of 10 to 30 lb dumbbells in 5 lb increments that make it a total package of 200lb. The user can add the weight according to his strength of bearing the heavyweights. The manufacture to the wider extent has ensured the principle of safety for its customers by using solid cast iron and coating it with a durable and protective black plastic. However, there are some pros and cons associated with the product that needs to be rationally considered when you step in the market. This product comes at a reasonable price. The rubber coating ensures the security of the floors of the gym and avoids injuries if the weights fall. The A frame is the feature that makes it more recommendable as it holds the weight tightly and keeps them organized. The product comes with a caution that it contains chemical known as phthalate that might cause birth defects and other reproductive harm. This chemical puts the fate of the product in jeopardy. The tightening bolts are either too long to fix or too lose to keep the weights locked. The product is designed keeping in view the physical requirements of the athletes. These dumbbells can do equal wonders in enhancing upper and lower body strength. This product also comes with a small rack to place the paired weights of 5 to 25 pounds once you are done with exercise. The most incredible feature of the product is that it has ergo handles which alleviate your fatigue to the maximum level. Moreover, the hexagon shape further adds to its features as the design prevents the bundles from rolling. Like all other products, the customer reviews are sensitive to its pros and cons. They are easily manageable within the small budget. The rack is easy to assemble and can carry all the weights. It’s easily manageable in the formal office settings to avoid fatigue in the employees. The necessary tools are missing that are required to assemble the rack. The smell is stinky and spreads in the environment which is quite irritating. The structural error can be stated in terms of its small size. The product comes with a complete package of accessories that complements its use at home gym. The package includes set of dumbbells of different weights, a dumbbell rack to keep the weights organized once you are done with your exercise so it gives a tidy look to your gym area and a rubber mat which would maintain the polish of your floor intact. Unlike Cap Barbell PVC Coated Dumbbell Set, 200-Pounds this product builds stronger or more space efficient storage units. The user safety is the core priority of the manufacturer. Heavy gauge steel is used in its manufacturing that is welded from all sides and is deburred both from inside and outside for user safety. The most favorable feature of the product is that it takes the responsibility of any defects in material or its quality. Like every product, these dumbbells also have some pros and cons so let’s have a look at them. The rack is solid and intact to hold the heavyweights. The weights are coated with a rubber material and are accompanied with knurling bars of chrome to keep them together. The weights are durable and long-lasting. A light film of oil on the weights somehow irritates the user as it can stain their clothes or floor. The strong odor of the rubber would be unpleasing for some. The knurling bars are a less powerful but still compatible with the other accessories. The Dura-Bell 8 Pair Dumbbell set with V2-Rack from the Hampton Fitness is an excellent innovation. Its high-quality features make it stand out amongst the other competitor brands. The interesting feature of Hampton Fitness is that it ensures that the head won’t come loose because it holds the U.S. Patent on the Round Cylinder Head that is screwed on the end of a Solid Dura-Bell Dumbbell Handle. Thereby, guaranteeing the structural integrity of the product. Moreover, Dura-Bell Dumbbell set comes with Urethane Encased Heads that reduce the noise created by dumbbells. The non-porous urethane coating is the feature that distinguishes this brand from the others and earns it more points. Hampton’s vertical rack is utilitarian and sturdy. This vertical rack is made by the high-quality Hampton’s material and utilizes a space saving design. The set includes 2.5 lb, 5 lb, 7.5 lb, 10 lb, 12.5 lb, 15 lb, 20 lb, and 25 lb. Dumbbells and One Vertical Two-Sided V2-8 Rack. Many of the customers who have bought it gave a 99% positive feedback. They acknowledged its high-quality features and its structural integrity and highly recommend its use for those who want to create a home gym. This dumbbell set offers a variety of weights ranging from 2.5 lb. to 25 lb so that you can use weight to add the desired resistance to your workout. The U.S. Patent on the Round Cylinder Head ensure that the Dura-Bell Dumbbells heads won’t come loose. You will not experience any toxic smell from inferior recycled rubber. It is coated with non-porous urethane coating. Its space-saving design makes it ideal for home use. The racks have minor design flaws. X Mark’s 550 lb. Premium Hex Dumbbell Set is considered as a must-have item of a home gym if you want to increase intensity of your workout. The versatility of this product makes it more desirable to be used by majority of the customers. The XMark’s dumbbell sets can be incorporated in a wide range of exercises to ensure a full body workout. Each Hex dumbbell features a knurled, chrome plated handle with a comfortable feel. Each dumbbell is composed of cast iron with tough rubber casting made from virgin and recycled rubber. The XMark’s Heavy Duty Three Tier Dumbbell Rack with an angled design makes it convenient for the athletes to pick up and leave the dumbbells on the rack. 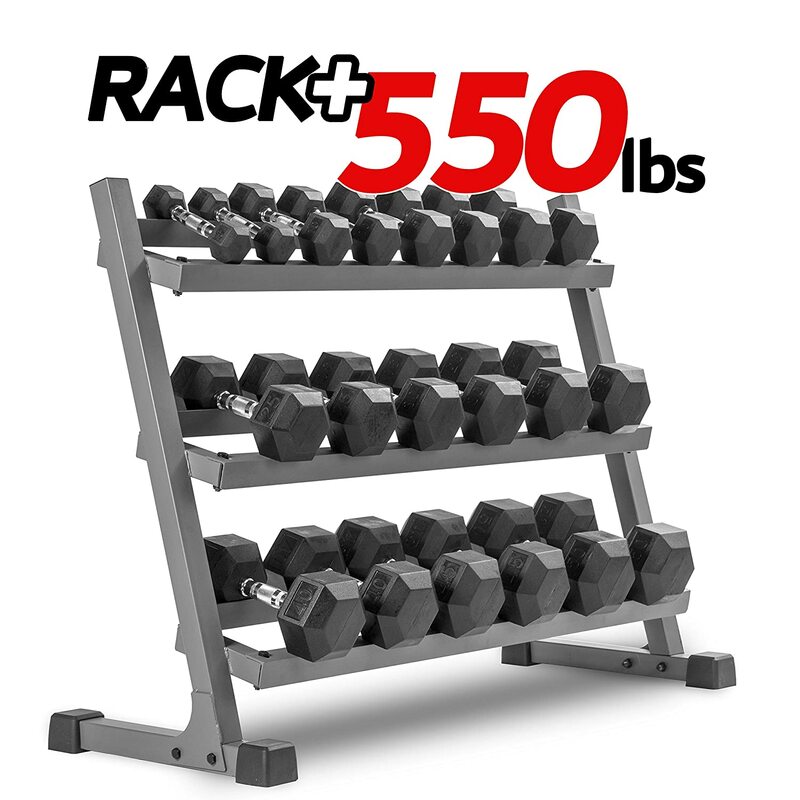 The rack has enough storage space to hold ten pairs of dumbbells and eliminate overcrowding of the weights, unlike other brands. The weights range from 5-50 lb pairs that make it perfect for beginners. It has an innovative rack design for improved access. The Premium Hex Dumbbell Set can be used in different kinds of exercise. The chrome plated handle of the dumbbells provides you a comfortable feel while exercising. Angled design make it more desirable for use, and the risk of weights falling down is minimized to zero. The XMark’s 550 lb. Premium Hex Dumbbell Set is not the best choice for small home gyms. If you are a beginner then start by using lighter weights to build up your stamina gradually. After use, store the dumbbells carefully by placing them back on the rack to avoid any hazard or injury. Always use gloves when handling heavy weights. If you handle them with bare hands, then the salt from sweat can adhere to the weights and will accelerate the rusting of weights. Maintain a good posture while lifting heavy weights otherwise; it can put excessive pressure on your body that could lead to numerous problems. While all the dumbbell sets mentioned above can fulfill your workout goals at home, our recommendation for you is to opt for Hampton Fitness Dura-Bell 8 Pair Dumbbell Set with V2-8 Rack. This dumbbell set carries a U.S patent that makes it recognized and structurally durable as compared to the other brands. It is an expensive product to invest on, but its high-quality features and user-friendly interface make it well worth the money. This product can give you significant benefits to start with as a beginner. The availability of different weights ranging from 2.5 lb to 25 lb helps the beginner in building resistance. 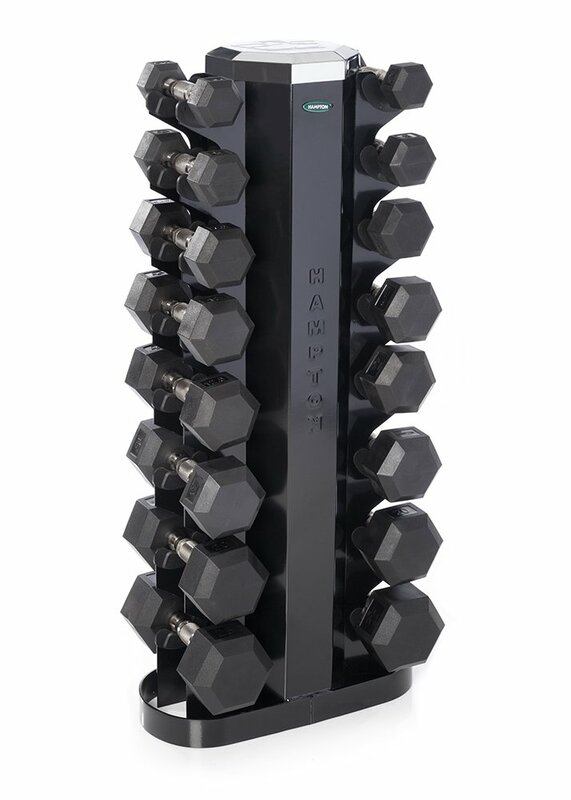 The urethane coating of the dumbbells reduce noise and makes it more environment-friendly as it carries no toxic smell, unlike the other products we have reviewed that come with a stinky odor because of the PVC coating. The strong odor hampers the efficient workout of the athletes. The two-sided vertical rack enables you to manage and organize your weights within a limited space available at home. All these features make it the best product to be used as a home exercise equipment.